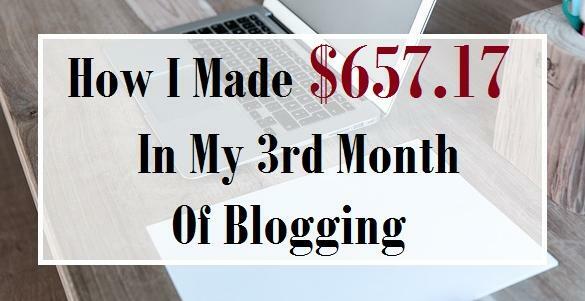 This ” How I Made $657.17 On My 3rd Month Of Blogging ” is my first ever income report. I am particularly proud of this and will always look back at this month as one of my greatest blogging achievements. I made this one after just 3 months of blogging. This post contains affiliate links/ads. See disclosure policy. Welcome to my April 2016 income report, my first ever. This is the one blog post every month that I show you in detail how I made money, how much I made, and my monthly goals. I told myself that I would post my income report once I started earning some money. Before I detail my earnings for the month of April, let me just give a background on why I decided to blog my income report. First, I like to see my income progression from month to month. When I say income, I mean income from blogging and anything related to blogging. I don’t count my day job income and whatever I receive from my side hustles in this income report. That’s just an FYI. I am a very visual person and I like graphs, charts, and tables. I need to see where I was and am at this point. I believe that blogging my report monthly will address that need. Second, I am a new blogger. I have only been blogging for 3 months now and have had triumphs and hiccups along those 3 months. I never thought that it’s possible to earn money this early but it has happened and I believe it will continue to be better from here (hopefully). I like to be an inspiration to those who are just starting out. I see and read a lot of bloggers who have not made money or have made a little bit of money even when they’ve been blogging for quite some time. I like to share my income report to show bloggers (new and veteran bloggers) that it’s possible to earn money this early. Third, I believe in transparency. While I blog just about anything and everything about personal finance and its intertwining, endless relationship with family and life, my blog is also monetary vehicle for me and my family. When you see advertisements on my blog posts (whether texts or banners), those are income-generating ads. Now, I know you will ask me how I was able to earn money even when I have only been blogging for 3 months. Social media played a big role in helping but it wasn’t just social media that contributed to my earnings. Here are the things I did that made a big difference. Follow-up. What I did this last month was I followed up with people who needed help. I joined a couple of groups mostly Facebook groups for bloggers. When someone asked questions, I not only answered their questions but also offered free help. I built relationship in the process. This free assistance translated into sign-ups for products and/or services (through the ads I have in my blog). Products/Services testing. Generally speaking, a lot of my friends and acquaintances are not aware that some consumer surveys aren’t scam. This past month, I showed them the money I received from the past couple of months from taking surveys. I convinced them to try taking surveys and now they’re making a few dollars here and there. For the month of April, I had 16,960 views. This should be more than that because for some reason my last two days (as you can see on the picture) had zero views. I don't know what happened in those two days. But that's fine. When I first started blogging, a blogger told me that it's better to have more conversion even when I don't have a lot of traffic. Now, I am convinced that it's true but I say it's true with reservation. I have reservation on his statement because I like to increase my traffic, gain more readers, and share my personal stories and views on personal finance, family, and life. I know I can contribute something of value to the readers. I am not all about money but it's always nice to get some in return. I always believe in setting goals. As I always say, going through life (in this case, blogging) without a goal is like walking on a long and winding road without a foreseeable end in sight. I know the goals I set for myself this May are both easy and difficult to achieve. But I like to always try and be better at what I do. So, it’s ok for me to set goals that are just difficult but not impossible to achieve. Pageviews. I want to see 1,000 views a day, at least. Maybe I’m shooting aimlessly but I will try my best to make this possible. I know it’s hard especially when a lot of my blogger friends are having a hard time hitting 1,000 views even after a couple of months of blogging. Cross fingers, I guess. Alexa rank. I like to be ranked under 400,000 (World) and 70,000 (US) by the end of May 2016. It’s probably a stretch but I’ll try it anyways. When I first looked at my Alexa rank, which was back in January 2016, I was unranked. On April 20th, I checked it again and I ranked 712,462 (World) and 113,853 (US). On April 30th, I was at 571,419 (World) and 88,728 (US). Social Media Presence. I want to increase my Twitter followers to 2,000 by the end of the month. As of today, I stand at 1,116. As with Pinterest, I like to increase my followers and improve my traffic from it. Of course, last but not the least, Facebook. I like to improve my fan page likes to 800 this month. Currently, my fan page likes stand at 337. This really sounds a stretch but it’s better to try. Guest post. I like to create more guest posts for this month. I only did 2 or 3 last month and would love to do more. If you guys are looking for guest posts, please let me know and I would be glad to create a post for your blog. I would like to double my income for this month. Yes, double the amount it is. It may be hard but I believe it’s doable. I may need to work harder but I am ok with that. Posting on bigger platforms. I was accepted to be Huffington Post contributor. I published my first ever post there on May 1st. My blog post was The Success Of Failure: How Failures Help Me Succeed. I wish to contribute to other platforms such as the CNN Money, Lifehacker, just to name a few. If you have any point of contacts, please let me know. If you ever want to create your own blog, you may want to visit my blog post on How To Start A Blog In 10 Minutes. Even when you don't have an idea on how to create a website, my how-to guide will show you step by step how easy it is to create your own blog. Great update. Thank you for sharing. Your ramp up is very impressive. I look forward to reading future posts. I’m not surprised because I’ve seen you put in the work! You have a great attitude and perspective to bring to the table, so I’m glad to see you’ve enjoyed your blogging experience so far. Keep up the great work. Wow Lan! You had a seriously incredible month; I’ve been around since the end of December and haven’t even cracked 1000 visitors yet (950 at the moment with 2100 page views.) Congratulations! That is an impressive income report, definitely an inspiration for other new bloggers like myself! Great work! Congratulations! I am a new blogger myself (3 months), but I am way behind on earning an income by blogging… I am still trying to figure things out. Very inspiring and helpful post! Thank you for sharing! Thanks for sharing Allan! It’s valuable to see this information and the goals you’re setting. And congrats on your April achievements! Nice work, my friend! Thanks for the encouraging post as well! Very Exciting! Great work, and I see a lot of actual work you have done, it helps me realize my goals are achievable, and I am on the right track. Thank-you for showing us! You are killing it with your blog success so far! I am so impressed. I will definitely be guest posting on your blog soon. I’ll pitch my idea to you by the end of this week. Very impressive!! I’ve been doing this for a year and have not really had a lot of monetary return. I need to focus more on making my site a little more profitable. I wasn’t really expecting much in the first couple of years while I built it up, but you’ve shown that’s it’s possible! Wow. This is a lot of great advice – congratulations on doing so well! Way to go! I appreciate your perspective here. You see the big picture and the reality of what it around you, so you aren’t unrealistic, but you are obviously driven. Good luck! Keep the reports coming! Allan your growth rate in 3 months is astounding! You have a ton of viewers and are making far more money than the average person. All the best with your goals. They are lofty but I believe you will be able to achieve them. Looking forward to next month and learning more from you. My friend and I just started a blog. We are struggling to know how to make money. I have been doing tons of threads and sharing etc. I happened upon your article in a CT thread. I really appreciate what you have shared. It will be very helpful to us. Thank you! Allan, congratulations! You are on a roll! It is nice to see that quick growth is possible with skill and hard work. Truly awesome that you were able to accomplish this in 3 months time. I remember we were wondering how long blogging would take to add up. It looks likes your views and income have sky rocketed. I’ll have to ask you for some advice. 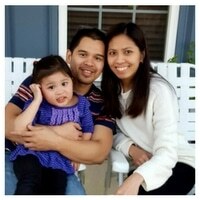 Great income post and nice job! This is impressive growth to start. Thanks for sharing your story with us. Great progress! Thank you for sharing your income report and info with us. It is so encouraging to see this working for other new bloggers, and it gives me hope! Nice work Alan! That is impressive! I have earned less than $100 with share a sale in a year and 3 months of blogging. Getting the high page views is my trouble. I don’t know how you manage to get 8,000 people to your blog! Thank you for the advice! This is great info. I’m starting my second month to blogging…now I have hope that income is possible. This is inspiring! I have a new blog as well which is of the same age as yours (3 months) but I barely earn money from it. I’m visual too. I love to see the charts and graphs. I’m so happy for you. It looks like you’re off to a good start. I’m new at blogging too. Going a little slower than you, but this is motivating to see other bloggers making money. Thanks for sharing your post and stats. As a new blogger, this is very helpful and encouraging to me. WOW. This is so impressive, and a huge inspiration to me. I am also a bit of a newbie blogger, but the fact that a blog like yours can generate this much income blows me away. I’m definitely going to try to implement some of the things in this post, in the hopes that I might see for some of the same results. Thanks for a great post. These are very good reports considering that you have just been blogging for three months. I look forward to seeing other monthly reports. Awesome job! I’d love to someday reach those stats… I have been seriously blogging since February and haven’t even reached 1,000 monthly views yet. Great job, Allan! Most of my income came from freelance work, but I aspire to be like you and begin including some blogging income. Your networking is paying off and I hope to learn more from you! This is incredible. Really appreciate the inside look at how it’s done! Congratulation 🙂 This is really great income! Way to go Allan. Those are really impressive numbers. WOW! Loved seeing this broken down – time to set some serious goals! Thanks. It’s never too late to set new goals and start achieving them. Wow Allan, What a great way to start a blogging career. You are getting good traffic and hopefully, you will be able to channel it into more earnings and profit. Thanks. It would really be nice to earn additional income, I am sure about that. Congratulations on your first income report, these figures are amazing! I have one question for you, what products do your promote with Shareasale and FlexOffers? Between Shareasale and Flexoffers, I promote Bluehost, Avant, Motif Investing, Personal Capital, Discover Bank, USAA, and small ones like American Consumer Opinion Post, Trackfone, and others. interesting, i’ll have to look into these. I’m just starting out as well and really need to improve my numbers. Great read. I’m curious as to how you got accepted on Huffington Post! Any suggestions there? I wrote directly to Arianna and after a day, she responded with a yes for me to go ahead and write for the Huff Post. If you need more information, please message me in my email and I can detail you everything. This is so inspiring! I’m glad to see someone making some money in such a short time. I’m hoping to follow suit. Nice job and how inspiring! You are a good example to follow. Wow! That is incredible growth! Congrats on the success so far and look forward to seeing what else you have for us! Great Job Allen! You have a killer blog and an awesome theme! Wow – super inspiring. This gives me hope! Hey Allan – really nice job. Well done, that’s a great amount to be earning. I hope our blog can earn as much as that once we start get ads and stuff going. Looking forward to reading about your next one.. It will happen sooner or later. We just have to hold on and keep on going and doing what we are doing. Hi Allan! I came your way through the Rock Your Blog FB Group, and glad I did! Looking forward to following you – its inspiring to newbies like me! Thanks. That’s one of the reasons that I wanted to share my income post, that is, to show new bloggers like us that it’s possible to earn more early on. Congrats on the success! That’s great. And fantastic strategy to make an effort to actually help people solve their issues – that’s really what blogging is supposed to be all about. I look forward to seeing many more financial successes from you in the future. In fact, I’m in the process of collecting blogs that share income reports and earn under $1000 (even if not for long). I think the progress of these bloggers could be great inspiration for others. I’ll plan to add you to this list once its posted! Thanks and please do add me. I would be honored to be included in your list of blogs that share income reports. I believe that what you are doing is really crucial and beneficial for bloggers who just started or just starting. This blog compilation will surely give them the hope and the strength to continue blogging. I can’t wait to see the list. Awesome job! That’s amazing that you’re making money already! Great job! That is a lightening fast start. Keep it up and best of luck! Wow! You are doing incredibly well considering how little time you have been blogging and are an inspiration to us all! Thank you. This is one of the reason that I published this post, that is, to serve as inspiration to many. That is incredible for your only your third month! I’ve heard great things about Share-a-Sale, but I just haven’t looked into it too much. I guess it’s time to start now! Congrats! It’s got a ton of affiliates. So far, I like what being part of Share-a-Sale. Great Job!! I’m going to check out Flex offers as another affiliate for my blog!! Thanks! So far, I’ve had good experience with FlexOffers. Try it and let me know how it goes for you. Wow! Congrats on those earnings and stats! I am also a new blogger, going on four months now and would love to increase my pageviews. Great post!! Thank you Lauren. Just keep doing what you doing and try to make connections with bloggers from different niches. They are friendly and provide a ton of advice. Congratulations on your blog growth! Hope that I could make my blog into something like yours has. Anything is possible with time, patience, dedication, hard work, and a lot of luck. Luck is something I believe in because I don’t think I would be able to earn this early without luck. Thanks for sharing! I need to work on my affiliate income! There’s no better time to try than it is now. Wow! Congratulations on the amazing success in such a short period of time! I needed all of these tips and suggestions – thank you so much! As a new blogger this was great to see what you were doing after only a couple of months! Thank you. I couldn’t believe it myself either. Congratulations! You have given me such wonderful encouragement. It is so appreciated. Thank you. This is one of the reasons that I posted this income report, that is, to show that it’s possible to earn this early. Congrats Allan! That is so great! Nice job crushing the affiliate marketing aspect as well! That’s what most bloggers struggle with. Yes, that’s what I heard from a lot of bloggers. I believe is both hard work and luck that got me some sales. Great job! Success can be achievable no matter how high you set it. It all depends on the time and effort you put in. Keep going best of luck. Congrats on the income! It’s always a good thing to achieve your goals. Congrats! You’ve made great success for only blogging for a few months. Oh my! Great job!! I’ve been blogging for 5 months now and am just starting to think about monetizing it. It is so much work to keep up. Looks like you are on the right track. You’ve got awesome page view and are making money already. Great job, keep it up!! Thanks. There’s really a lot when it comes to blogging. There are so many things that you want to do but time can’t seem to fit everything. I’ve been there and still there but it gets better with time. 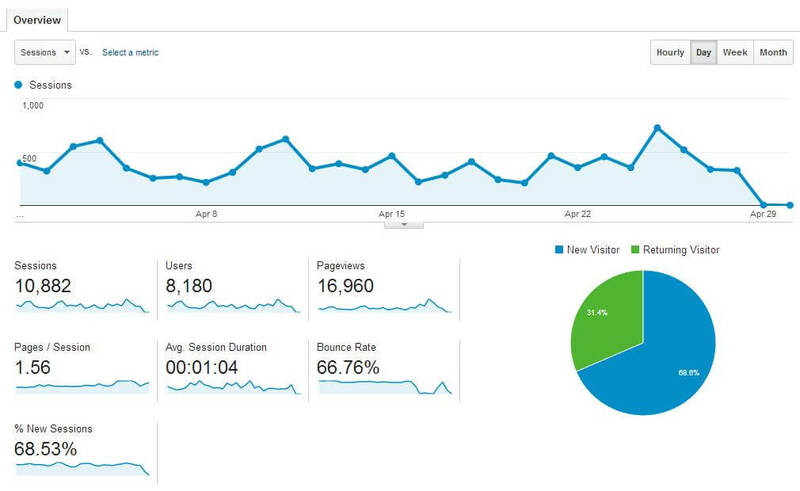 I’m not only impressed with your income and your page views after only 3 months of blogging. WOW. Thanks, Melissa. I always say that it’s both hard work and luck that allowed me to achieve this feat. I just can’t get past the 10,000 page views. That is nuts!!! Well done my friend. There is lots to chew on here. Thank you for the great content. Do you have recommendations for Huffington Post submissions and did you find your numbers went up after being published there? Thanks. From what I’ve been told Huff Post is a hit or miss. I didn’t see a lot of traffic coming my way but it was a great experience to write one for the HP. The best advice I can give is to send the best post you’ve got to HuffPost whether it is an original one or something that has been published on your website. Would you mind sharing what your best paying affiliate links are? I think many of us would be very curious to see. So many people have asked me about that. So, I will breakout those during my next blog report. Thanks. You are doing great! Thanks for sharing how you did it! I’m impressed! Your doing awesome for someone with such a new blog. Congrats! VERY impressive, Allan. I marvel at the efficiency you must have! Thoroughly impressed. Thanks. I believe it’s a combination of both hard work and just mere luck. Wow! I can’t believe how successful you have been in just 3 months! That is AWESOME! I am a new blogger and my site has only been live for about a week now. When did you start putting ads on your site? I’m not sure when I should start adding them. I would love any tips or suggestions you have! Thanks so much. Thanks. I started putting on two months ago. I suggest that you start putting ads when you feel that your site is in a good place. When I say in a good place what I mean by that is when you no longer worry about changing a lot of your site’s design and format. In addition, I suggest you put your ads when you have more content. This way you can attract more people to browse through your articles and better chances to get those ads noticed. You’ve structured your website very well and designed to precision. Do you have past experience online? Thanks for the complement. No, I never had any experience online. Creating this site was a trial and error. To tell you the truth, I had my site crash a couple of times in the past because I was playing around with so many things. Of course, these are lessons I learned for me. As everybody else has mentioned those are some awesome #s. I would have guessed you would have been blogging for at least a year to get those numbers. Congrats & keep up the good work! Wow, you’ve done a great job! I just started my blog up and I’m quite surprised that you were able to do this well after just three months. I’ll be following you closely from now on! I believe it’s both a combination of hard work and luck, mostly luck I guess. Thanks for following. I found your income report on Pinterest so I am a first time visitor! I’m really excited to start following your blog as you seem to have a lot of good insight and tips! Thank you for sharing and I look forward to more! Thank you for stopping by and reading my very first blog report. Whoo! Congratulations on your first income report! I am happy that you deserve this. I will try to sign up Flex Offers and see how it works. And… I’ve pinned yours in my board. Thank you for sharing! Thank you for stopping by and reading this post. I truly appreciate it. Thank you so much for really explaining BlueHost, and how it factors into both your hosting AND your adverts! I have been needing to find hosting, but I am a newbie, and didn’t know that hosts offered other benefits beyond just a domain and hosting. I think I will be going with bluehost! Thank you for reading this post. Getting a website setup can be daunting but it should be. Please let me know if I can be of any help to you. I’m here to help you setup your blog. Good luck.